Feeling Blue, Yellow or Purple? Asiadolly has been in the e-commerce world since 2006. We started off with Asiadolly - selling ladies fashion and then expanded to Lingeries (LingerieSG) in 2011. LingerieSG has been expanding rapidly (we now have 200+ designs!) and we have been focusing on LingerieSG since then. 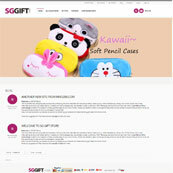 We also opened another website ScreenProtectorSG - selling screen protectors to our locals. We looked back and decided that we should do something to our founding website - AsiaDolly.